One of the biggest reasons why people play online pokies is for the chance to win massive prizes from the comfort of their own homes. But while there are thousands of Internet pokies out there, only a few offer truly life-changing opportunities. An initial look at Mega Moolah might not make it obvious, but it is one of the rare pokies that has the kinds of progressive jackpot prizes that dreams are made of. This deceptively simple game comes with the opportunity to win millions on every spin, making it one of the most popular and exciting poker machines on the Internet today. 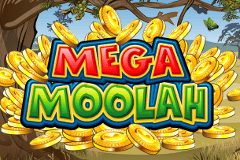 Mega Moolah is a five-reel, 25 payline poker machine that can be found at Microgaming casinos. Best known for its progressive jackpot, this pokie features an African wildlife theme. The artwork is cute, if not overly impressive by modern pokies standards: remember that this game first launched in 2006, and it has been around for about a decade now. If you’ve played pokies before, you know the goal: you need to match symbols from left-to-right across the reels in order to win prizes. The smallest prizes come from matching three or more of the “poker rank” symbols from left-to-right across the reels. The rest of the symbols represent various animals native to Africa, including zebras, giraffes, and elephants. For some of the higher-value symbols, only two in a row are needed to win at least a small prize. Players are given excellent control over how much they want to spend on each spin on Mega Moolah. You can play for coins worth anywhere from $0.01 to $0.05 each, can choose how many paylines you want to activate on each spin, and play up to five coins per line. That means it is possible to play for anywhere between $0.01 and $6.25 on each spin. Best of all, no matter how much you play for, you still have a shot at winning the progressive jackpot. There are three special features to watch out for when playing Mega Moolah, the most important of which (the progressive jackpot) we’ll talk about in the next section. However, there is also a wild lion symbol that can substitute for anything else on the reels. If you use a lion to complete any winning combination, it will double the value of the prize you would normally win. Paylines filled with lions can also earn you a lot of cash: the biggest standard prize in the game comes when you match five lions, earning you 15,000 coins. There is also a monkey symbol that acts as a scatter. This monkey earns you a prize if you find two or more anywhere on the reels; hit five, and you will earn 100 times the amount you bet on that spin. In addition, hitting three or more monkeys will earn you a free spins game. This feature not only gives you 15 free spins, it also triples your wins during those spins, potentially leading to significant earnings during the feature. But the most exciting feature of all is the Mega Moolah Progressive Jackpot. This bonus is triggered randomly, with your chances of triggering it being based on how much you wager on each spin (in other words, a $2 spin has twice the chance of a $1 spin of starting the jackpot game). Once you enter the jackpot round, you’ll spin a wheel to see which of four jackpots you’ll be awarded. There’s a Mini Progressive that starts at $10, a Minor Progressive that begins at $100, and a Major Progressive that starts at $10,000. Of course, the most desirable prize (and the one that is by far the hardest to win) is the Mega Progressive Jackpot. This jackpot begins at $1 million, and increases every time someone plays the game. In the past, the Mega Moolah jackpot has awarded numerous prizes, with the largest ever being a £13.2 million ($28.2 million) jackpot given away in October 2015. There’s no telling if or when that record could be broken, but Mega Moolah has awarded millions in dollars, euros and pounds dozens of times over the past decade. You might like to know that you don’t necessarily have to play this version of Mega Moolah in order to try to win the Mega Moolah Mega Jackpot. Other games like Mega Moolah Isis, The Dark Knight, and Mega Moolah 5 Reel Drive all give players the same shot at winning this massive prize. If you want to play one of the oldest and most popular online progressive jackpots in the world, Mega Moolah is the perfect Internet pokie for you. Mega Moolah may not be much to look at, but there’s really no better way to win millions on a single spin anywhere in the online casino industry. If Mega Moolah sounds like the kind of game you want to play, you can get started by joining one of the many trusted Microgaming casinos that offer this and many other great pokies.